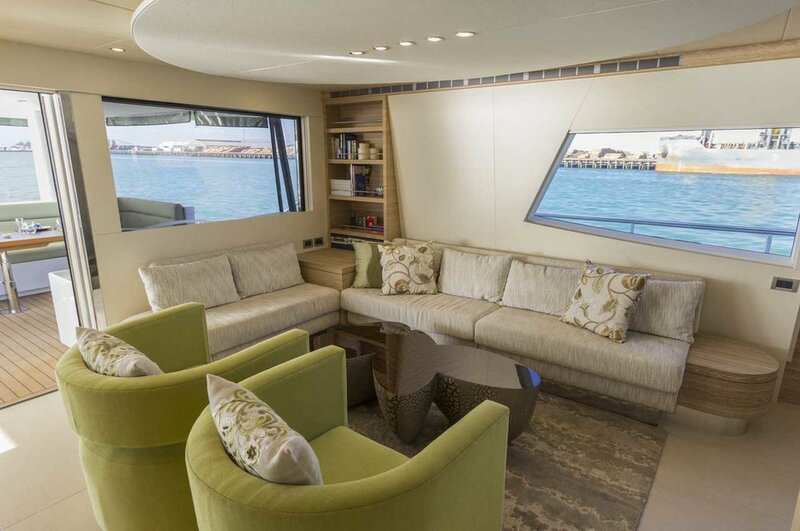 Samara’s main deck layout takes full advantage of the wide beam inherent to catamarans, being open plan keeps those in the galley at the heart of the action. Equipped with a five burner gas stove, steam oven, dishwasher drawers, freezer drawers, fridge freezer, trash compactor, dual sinks and plentiful storage for food, kitchenware, glassware and dinnerware. There’s even an auxiliary pantry large enough to store more than a month’s worth of food in the center of the salon, concealed below an electric opening hatch. When accommodating guests an additional freezer hidden on the lower deck can be switched on, ensuring everyone’s needs are met, and no power is wasted when their capacity is not needed, Samara is an affable host. The salon feels perfectly connected to the coastal environment through carefully selected forms, colours, textures and materials, a mixture of panoramic and framed views make a feature of any location. Large windows capture generous amounts of natural light, creating dynamic reactions as it passes through the space. The interior features horizontally laid bleached and cerused oak, the grain direction was chosen to enhance the horizontal dimension and calm mood of the interior. Majilite, marine vinyl wrapped panels line the headliner and a number of walls, while the floor is finished in a very efficient 1/8” lightweight porcelain tile. The island joining the Galley and Salon areas convenient for both dining and the ability to look out is lined in a beautiful Fleur de Lis granite, while the counter of the Galley feature a simple white Caeserstone, picked for durability. The fabrics of the furniture are soft chenille’s, carefully selected with heavy duty durability allowing elegance and comfort. Textures and patterns throughout the saloon were inspired by the organic shapes and colors of nature, such as the coffee bean table or accent rug in the salon, resembling foaming water. Fire makes a promethean statement aboard Samara, striking a humbling contrast between one of mankind’s first pieces of technology, and the contemporary electronic systems that manage the vessel. An unusual focal point for a yacht, the fireplace separates the main salon from a cosy sunken den; perfect for watching films on the retractable 40” TV or a quiet moment away from the action. In the salon a 55” TV reveals from the ceiling for viewing from the galley and port lounge. A wireless sound system fills the space with good vibrations to satisfy even the most sophisticated audiophile, music in each space on board can be controlled independently or synchronised throughout the vessel. With an integrated library of over a year’s worth of music, and thousands of movies and TV shows, there’s always something to compliment the mood. The living area flows seamlessly aft through glass sliding doors to the sheltered barbeque and dining area. With room to seat ten, the aft deck table can be adjusted for use as a dining or coffee table. This space can be totally enclosed from the weather via remote controlled transparent roller blinds; ducted heating from the gas fireplace warms both spaces, effectively making the aft deck part of the salon. A retractable window falls away to connect the galley with the bar in the aft cockpit, a drinks fridge is hidden below the barbeque for convenient access. Pantograph doors provide passage out onto the generous side decks, the central stairway wraps up to the wheel house. Hidden behind the door on the port side a walk in storage space is provided, while starboard conceals the day head. Port and starboard stair ways invite, lit up through their columns from large portlights on the lower deck.